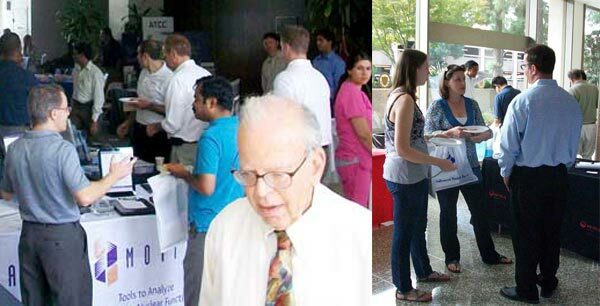 The start of our 2013 calendar year at Biotechnology Calendar Inc.™ is quickly approaching and we are close to selling out of life science exhibitor space at a number of our university events across the United States. This year we are offering 60 shows at top research universities across the United States and we are well into our current Fall Special. In our fall special we are offering discounted pricing as well as a free web link with every event purchased. With a web link, university researchers can easily move from our web site to yours on the web page advertising the event you will be attending. Many of our customers have already taken advantage of our discounted pricing and have bought tables at some of our most popular locations. Hurry, you do not want wait and risk missing out on the opportunity to connect with your targeted researcher audience. At our events we pre-screen all attendees so you can be confident you are marketing to people who want to buy your products. Already our shows at the University of North Carolina at Chapel Hill, and University of Southern California are sold out and only accessible through a wait list. For your convenience we have listed below the shows that are close to being sold out along with some funding and past attendance statistics to give you a better idea of which locations will match your budget and marketing strategy. Biotechnology Calendar is looking forward to making the 2013 vibrant and prosperous for our exhibitors and researchers at these events. Our shows are the best way to get involved in the life science marketplaces in the next year. Contact us or order online if you would like to reserve a space or if you would like to be placed on the wait list.